Vacheron Constantin once again challenged its most experienced master-watchmakers to create an extremely sophisticated Grande Complication wristwatch, equipped with an exceptional set of functions. They took on this terrific technical challenge to create a one-of-a-kind model named “Maître Cabinotier Astronomica”. This impressive feat of miniaturisation, driven by manual-winding Calibre 2755-B1, brings together 15 of the most demanding Haute Horlogerie complications and gives pride of place to astronomical functions. It is also the very first representative of a new and highly exclusive range of models crafted in the spirit of Geneva’s 18th century cabinotiers, combining exclusive production, personalisation and masterful accomplishments. This exceptional movement embodying a compendium of horological excellence and bearing the prestigious Hallmark of Geneva is housed within a 47 mm-diameter, 19.1 mm-thick white case. 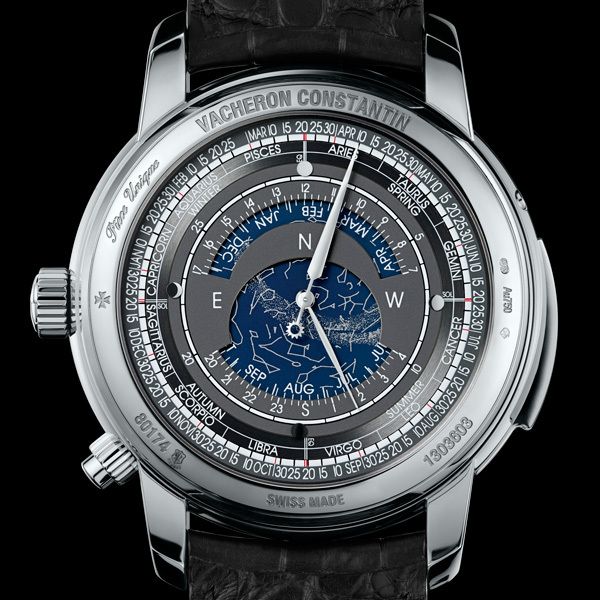 Inspired by the world’s most complicated wristwatch that paid eloquent tribute in 2005 to the 250th anniversary of the Geneva-based Manufacture – Vacheron Constantin’s very famous Tour de l’Ile, the unique Maître Cabinotier Astronomica watch once again demonstrates the remarkable expertise Vacheron Constantin has acquired in the art of combining multiple complications within an extremely small space. Boldly reaching for the stars, Calibre 2755-B1 is one of the most complex ever made by the Manufacture and features a number of unusual – mainly astronomical – complications. This mechanical manual-winding movement with a 58-hour power reserve offers an original combination of 15 complications driven by 839 parts, while measuring a modest 33.90 mm in diameter and 12.15 mm thick. These many useful functions, which can be read off on both the dial side and the back of this watch, constitute an authentic technical feat. Firstly by incorporating the specific mechanisms of the 15 complications within a wristwatch and ensuring that they run to perfection; secondly in terms of ensuring optimal legibility and comfort on the wrist; and thirdly by maintaining a sophisticated design and taut, sleek lines. Moreover, both this unique wristwatch and its movement bear the prestigious Hallmark of Geneva. Summing up the refined skills mastered by the Manufacture since 1755, this Grande Complication model named Maître Cabinotier Astronomica also evokes the spirit of the “Atelier Cabinotiers” created by Vacheron Constantin in 2006. This extremely specialised service of creating bespoke Haute Horlogerie watches reconnects with the time when Geneva’s highly specialised watchmaking artisans – the cabinotiers – plied their trade in attic-type workshops as they crafted unique watches commissioned by prestigious clients. The one-of-a-kind Maître Cabinotier Astronomica is a natural heir to this philosophy of combining watchmaking excellence with personalisation in accordance with customers’ individual wishes. Minute repeater, equation of time, tourbillon, perpetual calendar, date, day of the week, month, leap years, power reserve, sunrise and sunset times. In addition to the hours and minutes, no less than 11 complications are displayed with both clarity and distinction on the front, or dial side. 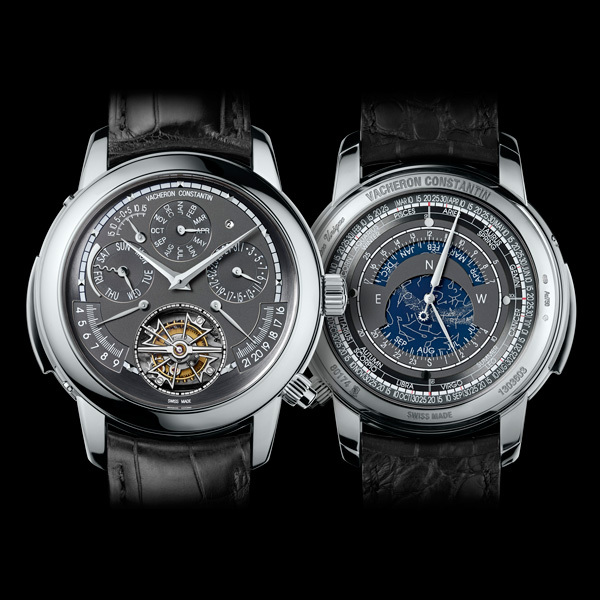 Two of the most sophisticated major Haute Horlogerie complications – the minute repeater and the tourbillon – pairs with various astronomical-type complex functions: a perpetual calendar, an equation of time, as well as indications of sunrise and sunset times. Among these captivating complications, the minute repeater deserves particular attention, in that it is fitted with an ingenious centripetal flying strike governor, developed by the Manufacture Vacheron Constantin. Perfectly silent and preventing undue wear of the frequently solicited striking mechanism, it serves to regulate the duration of the musical sequence in order to ensure that the notes chimed for the hours, quarters and minutes are both melodious and distinctly audible when the hammers strike the gongs. In addition to the minute repeater, the dial reveals a stunning tourbillon at 6 o’clock, equipped in the traditional manner with a carriage shaped like a Maltese cross, Manufacture’s emblem. The tourbillon rotates at a rate of one complete turn per minute, making light of gravity in order to improve the movement’s precision and also serving as a small seconds display. Meanwhile, the perpetual calendar, the “memory of time to come” is capable of keeping up with the complexities of the Gregorian calendar without any need for human intervention other than a date change every 400 years. The displays are symmetrically arranged with the day of the week appearing at 9 o’clock, the month at 12 o’clock and the date at 3 o’clock, while the leap-year indicator is discreetly positioned at 1 o’clock. 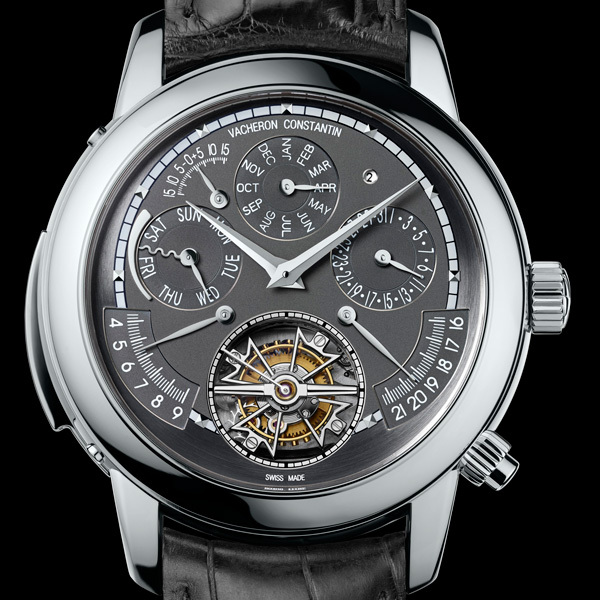 Equipping the watch with an equation of time, another fascinating complication shown by means of a short hand positioned at 10.30, also calls for considerable expertise. It serves to measure the difference in minutes between solar time and standard legal time. While humankind decided for practical reasons to divide each year into 365.25 days, each day into 24 hours and each hour into 60 minutes, the time as shown by the sun, or “true” time, differs according to the day of the year. This lag or advance varies daily, while remaining within the -16 to +16 minute range. This exceptional timepiece also has another type of astronomical complication that is a rarity in the field of horology: sunrise and sunset times. 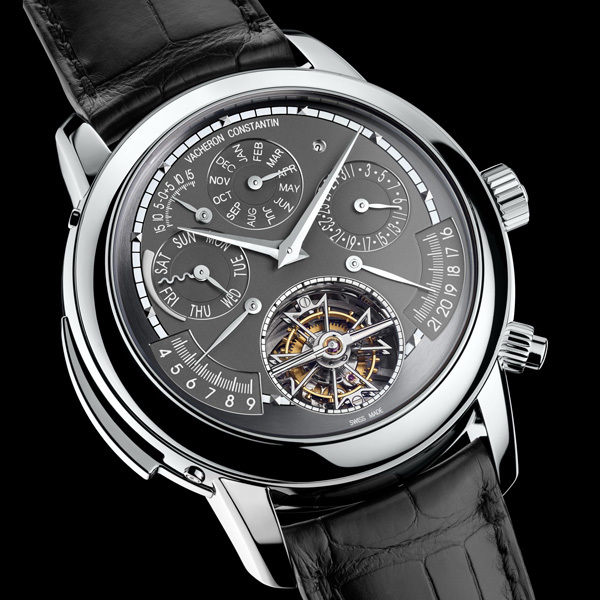 Involving a particularly delicate development process, this complication provides an accurate indication of this information for a given location on Earth – which in turn means that client must first choose the city for which he wishes to have the sunrise and sunrise times. The display of this “customised complication” is rigorously symmetrical, with sunrise appearing at 8 o’clock and sunset at 4 o’clock. 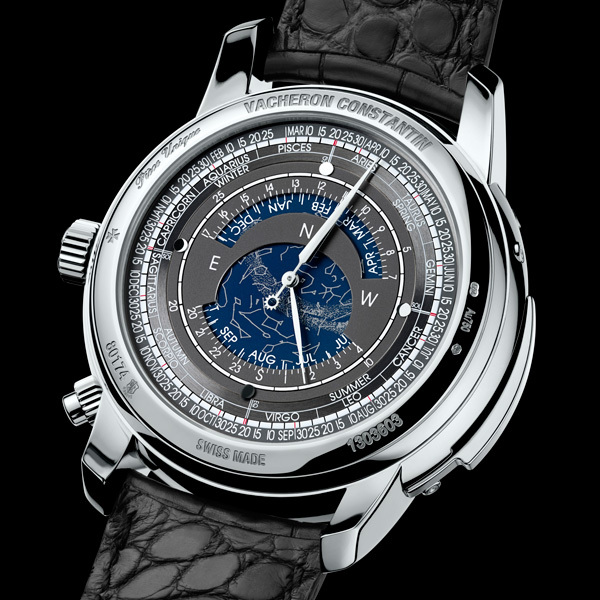 The back of this timepiece is just as fascinating as the front, since it features four complications and displays seven useful and interesting functions: a sky chart, the solstice, the equinox, sidereal time, the age and phases of the moon, the seasons, and the zodiac signs, forming a set of stellar complications that are extremely rare in the Haute Horlogerie firmament. This rare dial exclusively dedicated to displaying astronomical functions is built on two levels. The central disc bears a sky chart of the northern hemisphere, as well as the four cardinal points. Through two South and North openings, it symmetrically displays the months of the year and sidereal time, corresponding to “true” time. The latter indication is a necessity for watchmakers and enables them to adjust the sky chart according to the reference city chosen by the sole client. A small hand sweeping around the rim of the first dial level shows the age of the moon, meaning the number of days since the last full moon. Meanwhile, the second dial provides an array of extremely interesting astronomical functions. A long and slender central hand, tipped with a sun on its counterweight, rotates around the dial in pointing to the date on the outer rim of the disc. It also indicates the zodiac sign, the season, and finally the equinox or the solstice corresponding to the current date. While an equinox is distinguished by the equal duration of day and night, a solstice corresponds to a minimum or maximum length of day and occurs twice a year somewhere around June 21st for the summer solstice and December 21st for its winter counterpart. The days on either side of the summer solstice are the longest of the year, while those near the winter solstice are the shortest. The equinoxes are the two days of the year when the sun changes hemisphere and passes over the equator at its exact zenith. A year comprises two equinoxes: one between March 19th and 21st, and the other between September 22nd and 23rd. These dates are regarded as corresponding to the beginning of spring and autumn. superlative movement in every sense of the term, equipping a unique watch and adaptable to the reference city of the owner for whom it is intended, Calibre 2755-B1 once again proves the exceptional mastery and the capacity for innovation of the Manufacture Vacheron Constantin. While pushing technical limits to new extremes, it remains consistently attentive to the user friendliness of a timepiece, even when it offers a large number of complications. The engineers and master-watchmakers have developed a calibre fitting smoothly inside a case graced with slender lines despite the multitude of parts required by such an elaborate mechanism. 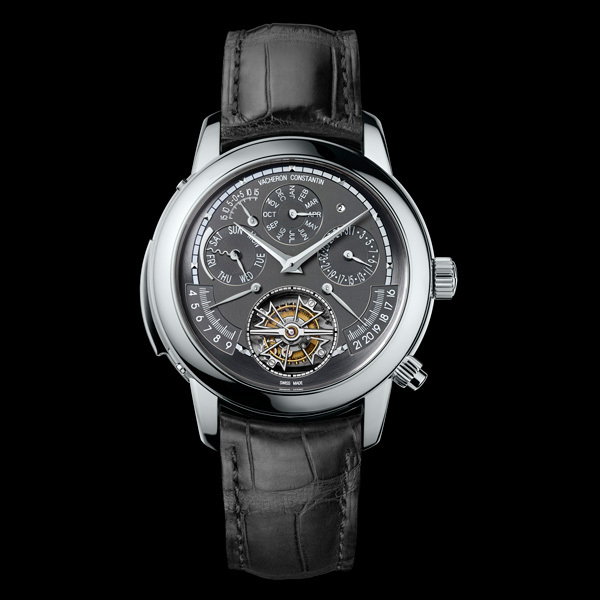 The characteristics of the white gold case are designed to ensure the remarkable sound quality of the minute repeater. Moreover, providing a pleasantly balanced and readable display of these multiple functions is a tour de force in itself. The entirely in-house developed and produced Calibre 2755-B1 perfectly reflects the philosophy of excellence that Vacheron Constantin applies to conceiving and making its Grande Complication models. Each part is finely adjusted and harmonised so as to guarantee optimal performances, making each movement a unique masterpiece. Its impressive level of finishing is expressed through meticulously hand- bevelled bridges adorned with Côtes de Genève, a circular-grained mainplate, as well as the smoothly rounded- off tourbillon carriage bar. Like the watch as a whole, the movement bears the prestigious Hallmark of Geneva certifying that it meets the numerous highly demanding criteria of this supremely independent label that offers a guarantee of provenance, top-notch precision, durability and watchmaking expertise. This symbol of horological perfection notably signifies that the movement decoration is entirely hand-crafted. This highly unusual combination of 15 particular complications within a single watch demands a degree of mastery that is truly exceptional in the spheres of Haute Horlogerie. In light of its complexity and originality, the Maître Cabinotier Astronomica is quite naturally issued as a limited edition of one.